If you’d been around in the late ’60s and spotted a modern-looking 4x4 sporting ‘VELAR’ lettering on its bonnet, you could be forgiven for being baffled. What the heck was a Velar? Was this a car company that had yet to launch, or perhaps a new model name that was about to be officially unveiled? In fact, both suggestions were wrong. Velar was a made-up moniker created by Mike Dunn, an engineer at Alvis, apparently using a combination of the letters from Alvis and Rover. And it was there to deliberately keep people guessing, diverting attention away from the fact that this was a prototype of the new-for-1970 Range Rover. 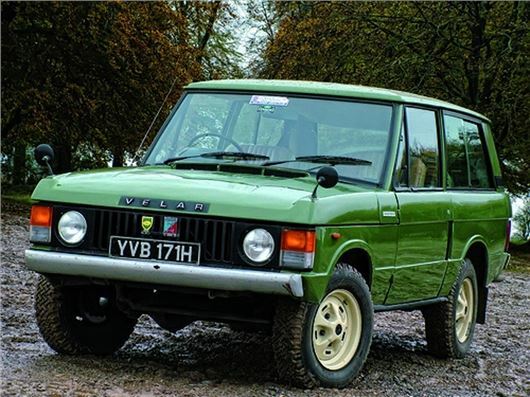 To confuse matters still further, the Velar Motor Company was formed and used by Geoff Miller (the Range Rover’s development engineer) as an official decoy name for registering pre-production Range Rovers. The first Velar was made in the summer of 1967, after which six further engineering prototypes and a driveable chassis were built. The last of this run, built in January 1970, was virtually production standard. During 1969, a production line was constructed at the Solihull factory, which saw a total of 28 pre-production prototypes being built. These vehicles were assigned London registrations of the series YVB 151H through to YVB 177H, and a number of them were despatched to the engineering department for use in on-going development. A few Velars were used for publicity, ending up featured in promotional film footage and magazine test reports. Meanwhile, surviving Velar prototypes are now particularly sought after within the Range Rover Register, with only three of the ‘YVB’ pre-production prototypes still unaccounted for at the time of writing.